Fifteen-year-old Frankie Landau-Banks has grown up a lot over the summer. She’s no longer daddy’s little girl – and almost immediately after starting the new semester at her highly prestigious school, she bags goofy-but-gorgeous Matthew Livingston as her boyfriend. 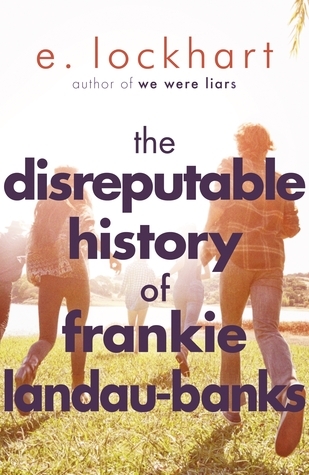 They get along great but then Frankie discovers that Matthew is a member of a boys-only secret society that specialise in ‘hilarious’ pranks. Which hardly seems fair… especially when Frankie knows she’s smarter than any of its members. And to prove this, she’s going to teach them a lesson. I unfortunately didn’t really enjoy this one as much as I’d have liked. As mentioned in my previous review, E. Lockhart has a very unique style, and it shone through once again in this novel. Unfortunately, the first word that comes to mind when I think of this novel is slow. I just feel like for a book of over 300 pages, not much happens in this book at all. Frankie spends a while at school. She gets a boyfriend. She uncovers secrets, and she pulls some clever pranks. She ends up pretty much back where she started. Her relationship with Matthew bothered me a lot. She talks about loving him – but never actually explained why she loves him. In fact, she seemed angry at him for most of the book, and there doesn’t actually seem to be that much of a relationship between the two. So what did I actually enjoy about this book? A lot of what I liked about it was the cleverness of E. Lockhart. The whole complicated plot and pranks and basset club were just so imaginative and clever. I really admire her for creating something refreshing and different from so many other YA novels. This is just so…unique, which lives up to my expectations of E. Lockhart. The plot development reminded me a lot of Fly On the Wall, also by E. Lockhart. It seemed we spent a lot of time reading this slow story for not much of a reward at the end. I felt so different about Fly On the Wall, simply just because I think we got a reward for finishing the story. Let’s talk about this book being a feminist novel. Sure, I understand this. But I don’t actually think Frankie portrays a great role model. She’s a very jealous person who manipulates people to get what she wants. I felt her ‘love’ for Matthew was a complete lie and for once, I wish there was more focus on the romance and development of it. Overall, I have really mixed opinions of this book. It left me confused and I definitely feel like maybe I didn’t understand the full message it was trying to portray. But what I do understand and can analyze, I unfortunately cannot bring myself to love.